Why is the economic recovery so weak? 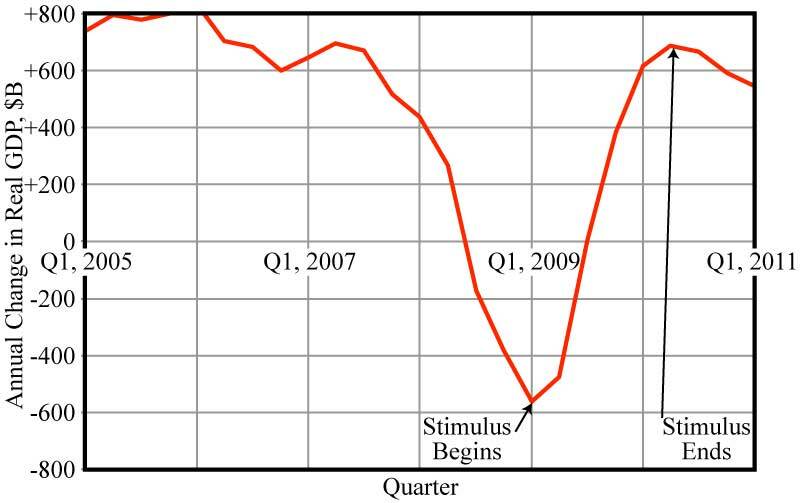 Why is the current economic recovery so much weaker than in the previous two recoveries? I don’t claim a profound knowledge of economics, but here’s what I think. During the time of peak prosperity, the American economy was based on a benign cycle—high wages supported a mass consumer market, which supported high employment. Since the 1980s, American wages have been stagnant or falling, and Americans maintained their purchasing power by means of borrowing. But since the 2008 recession, they have reached the limits of their power to borrow and spend. Big financial institutions and holders of financial assets are investing more in debt instruments or in production overseas than in job-creating enterprises in the United States. At the same time government at all levels has responded to hard times by cutting spending and employment. Both the public and private sector are dis-investing in education and training, in scientific research and in the infrastructure necessary to a productive economy. Barring a change of direction, I expect things to continue to worsen. How can we the people turn things around? Being honest about the situation would be the first step. Government could stop doing harmful things, such as the no-strings bank bailout and pro-corporate trade agreements. Corrente’s 12-Point Platform is the kind of thing we should be thinking about. The great danger of so-called artificial intelligence is not that computers will become sentient beings, but that decision-makers will treat them as if they are. Machines are tools. They are a means to multiply human strength and to duplicate repetitive human tasks. They are highly useful. But they are not a substitute for human skill and judgment. The use of automatic pilots in airplanes is a good example. An automatic pilot will make fewer errors than a human pilot, especially if airline management has pushed the human pilot to the point of exhaustion. But excessive use of automatic pilots means that the human pilot’s skills wither, and the human is less able to respond in an emergency that doesn’t fit the computer algorithm. Another example is the use of the Internet and automatic answering machines for customer service. I don’t think anybody who has ever had to deal with one of these things thinks that they provide improved customer service. Their purpose is to create a barrier between the organization and the public in order to save money, but also in order to free the managers from the inconvenience of having to deal with actual human beings. Machines don’t talk back. Not even self-directed machines talk back. Neither do they exercise judgment or think of ways to do the work better. But from the standpoint of a bureaucrat whose goal is the seamless exercise of power, the latter consideration is unimportant. It is much more convenient to program machines than to deal with employees or deal with the public. It’s interesting that the report of gains in jobs and a drop in unemployment was followed by a drop in stock prices. Conceivably this could be been due to the improvement being less than expected, but analysts quoted in my morning newspaper said investors fear that the apparent recovery will cause the Federal Reserve Board to stop holding down interest rates in order to stimulate the economy. A certain number of people can be expected take their money out of the stock market and put it in savings accounts in banks, or in bonds, because they would getting actual interest income again. In other words, stock prices reflect an unsustainable government policy, and not the real health of the economy. 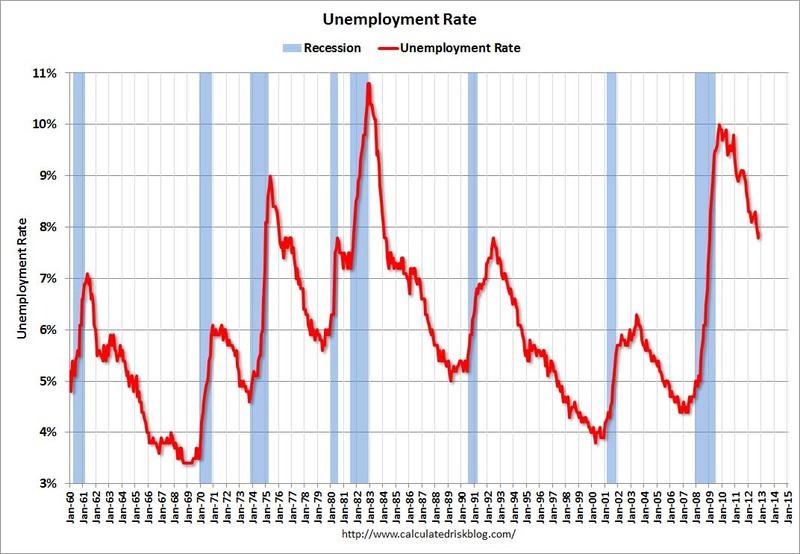 Still, it’s good news that the unemployment rate is falling, and is falling by every measure. 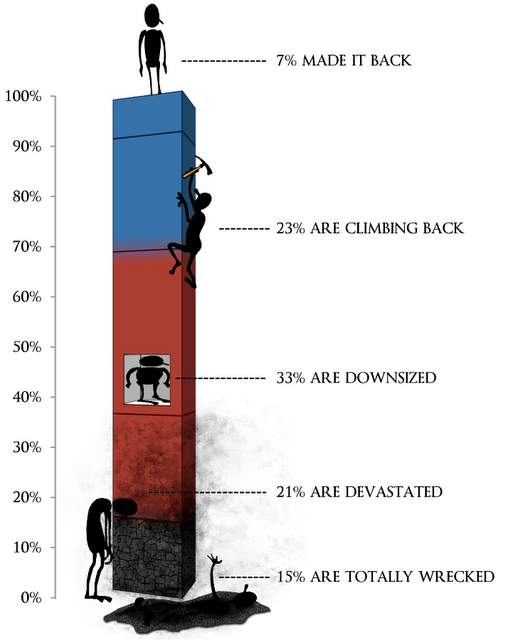 The AFL-CIO has an excellent series of infographics about what’s wrong with the U.S. economy, which I have put into this post. For those who have a little time, I link to four articles explaining the infographics. For those who have more time, I then link to background information on which the articles are based. My only argument with the AFL-CIO is that they attribute bad economic policies exclusively on Republicans, while ignoring Wall Street Democrats such as Bill and Hillary Clinton, Barack Obama, Joe Biden, Chuck Schumer and Christopher Dodd. I read the following dispatch from my former home town this morning. HAGERSTOWN, Md. — When the Good Humor ice cream plant closed here two summers ago, more than 400 jobs and a stable, punch-the-clock way of life melted away, another in a string of plant closings that have battered this once-proud manufacturing town. The hulking plant sat vacant until a co-op of Virginia dairy farmers purchased it in summer 2013 to process milk and ice cream, though on a far smaller scale than the 60,000 cases of ice cream that global food giant Unilever churned out every day. Randy Inman, the board president for Shenandoah Family Farms, said he expected the plant’s revival to trigger plenty of interest in its three dozen or so initial jobs. What he did not expect: 1,600 applicants and counting — a deluge. I’m glad the Washington Post is reporting on this, but in my experience this kind of situation is neither new or unusual. I remember when I was reporting on business here in Rochester, N.Y., 20 and 25 years ago, any announcement that a company was hiring would result in a line of job-seekers, comparable to Black Friday shoppers, who would start getting in line at midnight or earlier so as to be one of the first in the door when the office opened. My job-seeking friends tell me things are just the same today. The Republicans (along with some Democrats) in Congress who don’t want to extend unemployment benefits think that the secret to getting people back to work is to give them a kick in the pants rather than a helping hand. It is true that there is a hard-core group of people who lack motivation and forethought, and probably would do badly even in a high-wage, full-employment economy. Even with the so-called underclass, there might be more hope for their children if they had more evidence that staying in school and working hard paid off. As the Washington Post article illustrates, even people with a strong desire to work are up against it. This is true, although in terms of purchasing power, the Australian minimum wage for fast-food workers is more like $12 in the United States. 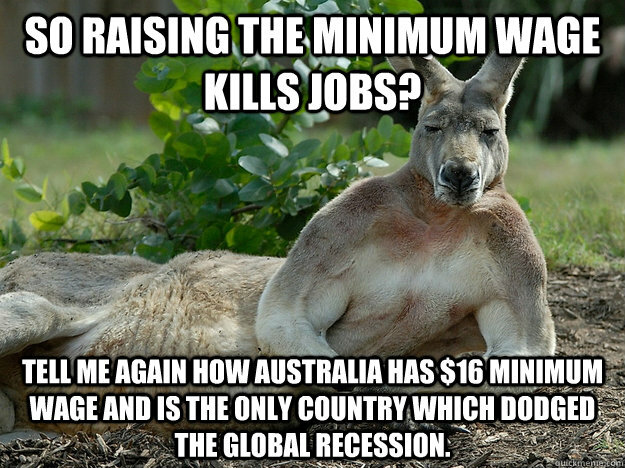 Click on Australia minimum wage for details from the Real News Network. Many economists say, without any empirical evidence, that an increase in the minimum wage will automatically result in increased unemployment. This is because it is a basic principle of economics that if you increase the price of something, people will buy less of it, and so it is with wages. Under certain conditions, that would be true. Fewer people would be hired for minimum wage jobs if, say, the U.S. minimum wage was raised to $72.50 an hour. But there is no evidence that any of the actual increases in the minimum wage have had any adverse measurable effect on U.S. employment. Indeed, the number of minimum wage and near-minimum wage jobs has increased dramatically since 2007-2009, when the minimum wage was increased from $5.15 to $7.25 an hour. The basic concept of economics—that the law of supply and demand describes how people respond to economic incentives—is true as far as it goes. This concept has such beauty and explanatory power that it is easy to forget the other dimensions of human behavior. Economists who forget this wind up like the physicist in the joke, who could infallibly predict the outcome of horse races, provided there were spherical horses racing in a vacuum. Click on Saturday Morning Breakfast Cereal for more like this. Why don’t politicians care about working people? Mark Thoma, professor of economics at the University of Oregon and host of the Economist’s View web page, wonders why politicians in general and Democrats in particular are so little concerned about the plight of American working people. Consider… four facts from a recent speech by Federal Reserve Governor Sarah Raskin. First, around two-thirds of the jobs lost during the recession were in moderate-wage occupations, but more than one-half of subsequent job gains have been in low wage jobs. As she says, recent job gains have been largely concentrated in lower-wage occupations. Second, since 2010 the average wage for new hires has actually declined. Third, about one-quarter of all workers are “low wage” (just over $23,005 per year in 2011 dollars). Finally, involuntary part-time work is increasing, and more than a quarter of the net employment gains since the end of the recession involve part-time work. I don’t blame Republicans for their efforts. I wish the working class was more important to Republicans, and I cannot understand their indifference to the struggles of so many people. But that’s not who Republicans are. Fundamentally, it’s the party of the rich and this is a chance to lower government spending and reduce the pressure for tax increases on high-income households. Click on Why Don’t Politicians Care about the Working Class? for Thoma’s entire article. Click on Focusing on Low- and Moderate-Income Working Americans for Sarah Raskin’s speech. The October jobs report shows the U.S. economy continues to recovery, but, as this chart from the Calculated Risk web log shows, at a much slower rate than previous post-war economic recoveries. Since the 1970s, each economic recovery has been weaker than the previous one, with slower growth in jobs and hourly wages at a lower rate than in the previous recovery. But in my opinion, the reason the 2007 recession is so much worse is the 2008 Wall Street crash, signaling the unsustainability of an economy based on debt and speculation rather than borrowing. Here are some more charts, also from Calculated Risk, which show the state of the U.S. economy in the light of the latest job report. 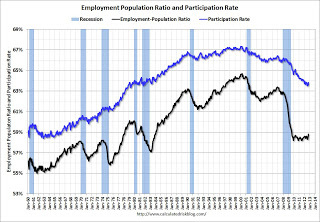 The lower chart, which shows the proportion of the population in the labor force and the proportion with jobs is probably a better measure of the employment situation than the unemployment rate, which is the percentage of the population looking for jobs who can’t find jobs. You should notice that the bottom line on the chart is not zero, which means that the variation at first glance seems greater than it really is. 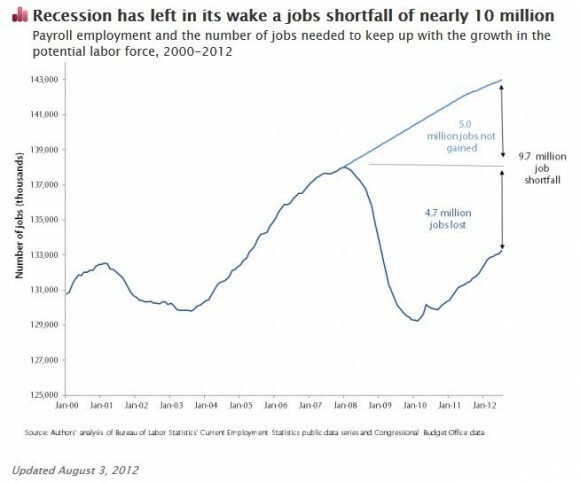 The job losses in the recession were mainly well-paying, middle-class jobs, and the job gains are mainly low-paying, less desirable jobs. And while any increase in jobs is good news, the rate of job growth is barely enough to keep up with growth in the population. I think President Obama deserves some credit for the fact that things are not even worse than they are. I think his stimulus program helped, and, while I disagree with the way the bank bailout was handled, I think the recession would have been far worse if the administration had stood idly by and let nature take its course. 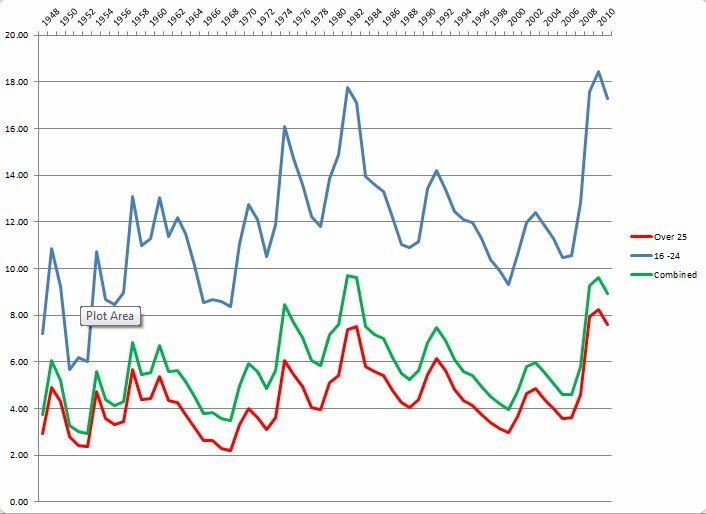 Here is another Calculated Risk chart, which compares the current U.S. recovery with the Great Depression of the 1930s in the United States and with other nations which have gone through financial crises in the past few decades. 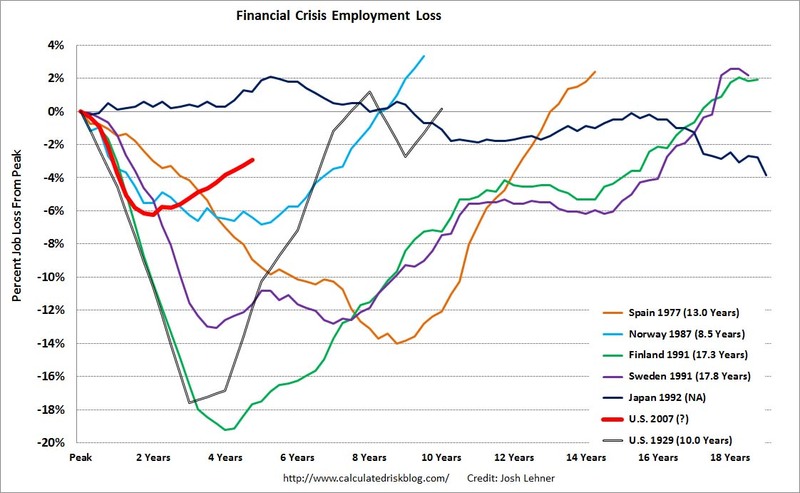 What this chart shows is that the financial crisis in the United States could easily have been much worse than it was. Unfortunately, the Obama administration failed to take action to prevent a future financial crash. It declined to prosecute for financial fraud nor to restructure failed financial institutions, as was done in the aftermath of the savings-and-loan crisis. Obama’s administration worked pro-actively to prevent legislation that would break up the too-big-to-fail banks or to take meaningful action to limit speculation with federally-insured bank deposits. As a result, the Wall Street financiers who were responsible for the financial crash, except for the executives of Lehman Brothers, wound up better off than they way before. The predictable result of this will be another financial crash, a bigger and worse one than the 2008 crash. I am not smart enough, or foolish enough, to say when this will be, but when it happens, it will be a political disaster for whatever political party happens to be in power at the time. The broader problem is that the United States has slower economic growth than in the 1950s and 1960s, and an increasing share of the benefits of that growth are going to a tiny minority of the population. I think both trends are the result of the globalization of the national economy. To some extent, slower economic growth and wage stagnation are the result of the leveling of the playing field between American workers and workers in Latin American and eastern Asia. I don’t complain about this. It would be shameful to try to maintain my high material standard of living by trying to keep people in other nations poor. The other aspect of globalization is that the world’s economic elite have the means to escape regulation and taxation, and that international economic institutions—the World Trade Organization, the International Monetary Fund, the European central bank—operate to protect the interests of financial institutions and the economic elite from national governments. I can imagine an alternate globalization in which international institutions work to raise labor and environmental standards, but at present workers and scientists are not in charge. I wouldn’t expect Barack Obama to be able to change the situation all by himself, although I think a President is in a good position to raise awareness of the problem. Nor do I think that Mitt Romney offers a better alternative. His Bain Capital is part of the problem. Change, if it comes, will have to come from an aroused public opinion. Click on Calculated Risk: October Employment Report for a more complete analysis of the latest Bureau of Labor Statistics report. Click on Modest Jobs Growth in Latest Economic Report for a more readable and less technical analysis by the New York Times. General Electric’s ex-CEO Jack Welch can’t believe that the U.S. unemployment rate actually fell to 7.8 percent in September. He thinks the Bureau of Labor Statistics is manipulating the data. It is understandable that he should think that way. GE was fined by the Securities and Exchange Commission for manipulating its earnings data during Welch’s watch. When I reported on business for the Rochester Democrat and Chronicle some 20 and 30 years ago, I had dealings with statisticians and analysts for the New York Labor Department and the U.S. Bureau of Labor Statistics. They were thorough professionals. They were like scientists and engineers. They didn’t care what I wrote so long as I understood the figures and wrote about them correctly. 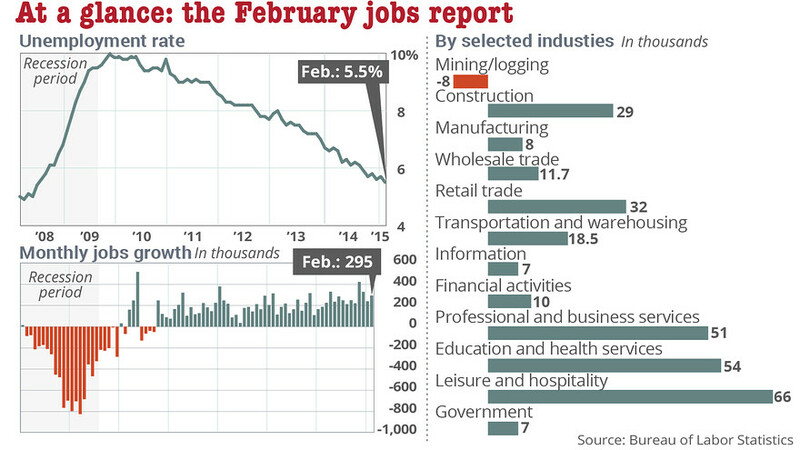 The monthly jobs figures are come from two sources, a household survey and an employer survey. The household survey is based on asking a cross-section of the population whether they are employed and, if not, whether they have looked for work during the previous month. These two figures are used to generate the monthly unemployment rate. 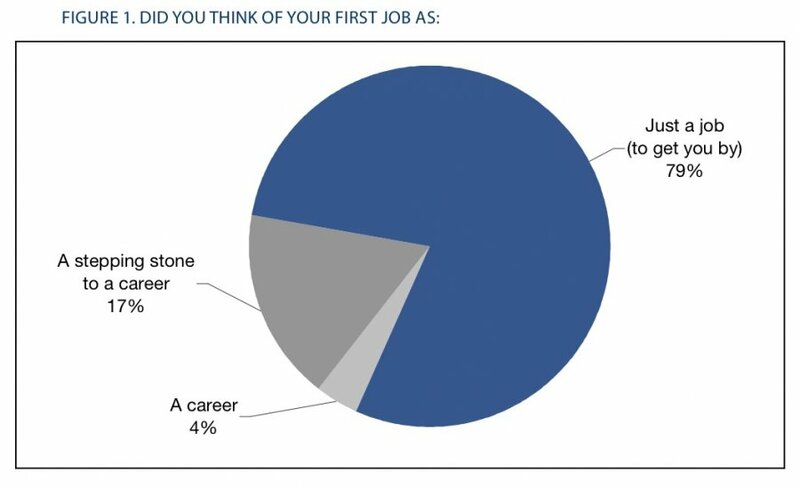 The employer survey is based on interviewing a cross-section of employers as to whether they have hired or laid off employees during the previous month. Based on these results, the BLS adds to or subtracts from a benchmark figure of the number of jobs. The benchmark figure is based on an actual count of the number of people paying workers’ compensation taxes. It is the most accurate and meaningful figure, but it is always at least six months out of date because it takes time to add up all these figures. 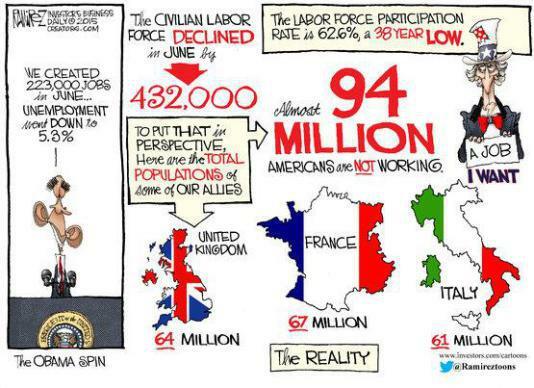 The unemployment rate number probably is an undercount. It does not include “discouraged workers” who’ve stopped looking for jobs, or part-time workers who’d like to work full-time. The jobs number also is often an undercount. It does not include the number of jobs created by formation of new businesses. The BLS only catches up with those jobs when it does a new benchmark, which is what happened in September. Both figures over time are accurate indicators of the trend. If you always conduct a survey in the same way, then, even if it is flawed, it will always be flawed in the same way. It’s not unlikely that the unemployment rate is exactly 7.8 percent, but it is certain that it is lower than it was at the beginning of the year when it was reported at 9 percent. Reports of earnings by corporations such as General Electric, in contrast, allow a lot of discretion in how things are reported. By timing transactions on which a company takes a profit or a loss, the earnings can be made to appear much more stable than they otherwise would be. This is not uncommon and, in and of itself, it is not necessarily dishonest. It has to do with the timing of what is reported, not the content. A company that is really unprofitable could not smooth its earnings that way. But in Welch’s case, GE did overstep the bounds and had to pay a fine to the SEC. As to the significance of the figures, it is still true that the current economic recovery is weaker than any U.S. recovery since the Great Depression. I don’t think this is President Obama’s fault. It is the result of decades of a hollowing out of the U.S. economy and the substitution of debt for income. 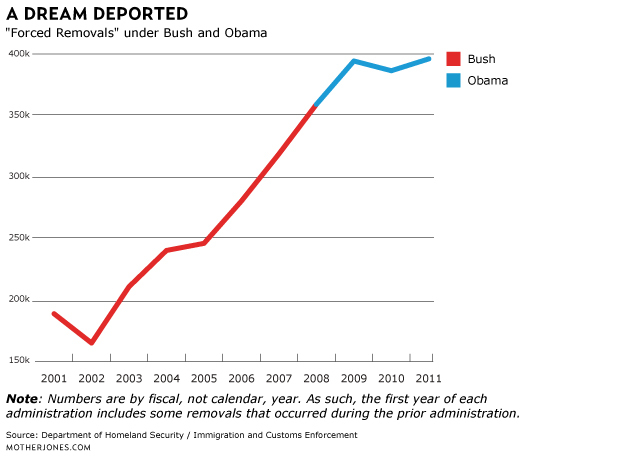 I think the Obama stimulus did as much as can reasonably be expected, and the Republican leadership was and is opposed to the President doing anything more. My criticism of Barack Obama is on other grounds—that he is anti-labor, pro-Wall Street and indifferent to the plight of foreclosure victims, and that he opposes the necessary steps to prevent another financial bubble and crash. The Economic Policy Institute, a non-profit research organization which studies trends in wages and employment, has just issued its latest State of Working America. Its facts and figures show that conditions were not good for wage-earners even before the Great Recession, and that, even though the recession is officially over, the United States has a long way to go before working people recover lost ground. The Great Recession was by far the worst in the United States since the end of World War Two. 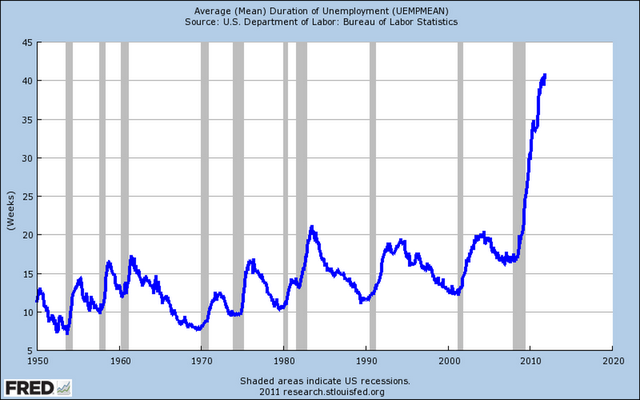 And while there has been recovery in economic output, and in the financial markets, the United States is a long way from getting back to a full employment economy. 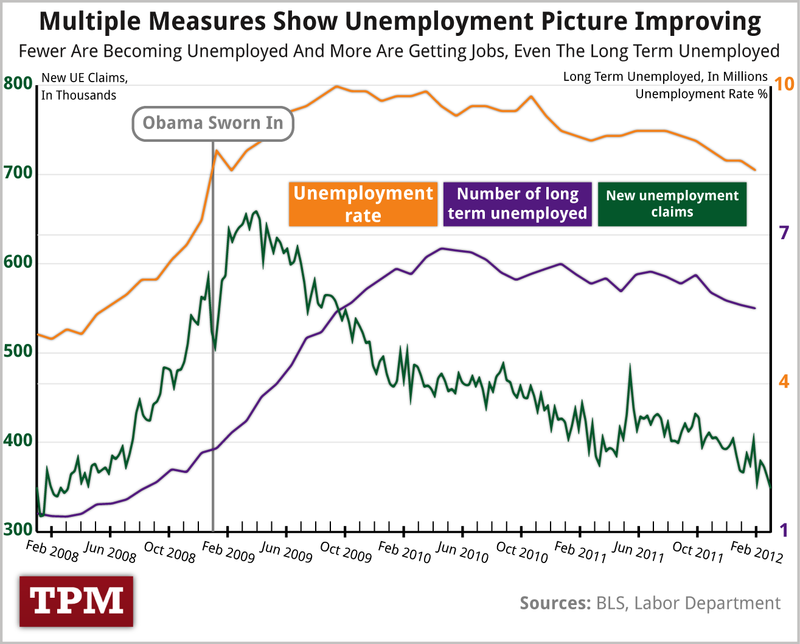 There has been some improvement in jobs, perhaps partly because of President Obama’s stimulus program, maybe partly because of the natural turn of the economic cycle, but not to pre-recession levels. 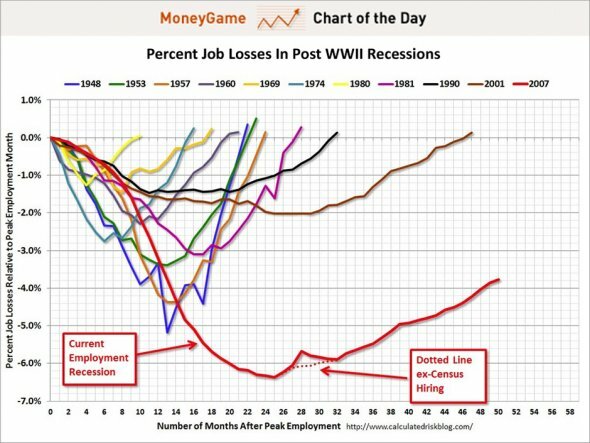 I believe that the reason the Great Recession was so bad and the recovery is so weak is that it is more than a routine downturn in the economic cycle. I believe the United States has reached the limits of creating spending power by substituting credit for income, and we Americans need to somehow recreate an economy based on production rather than finance. 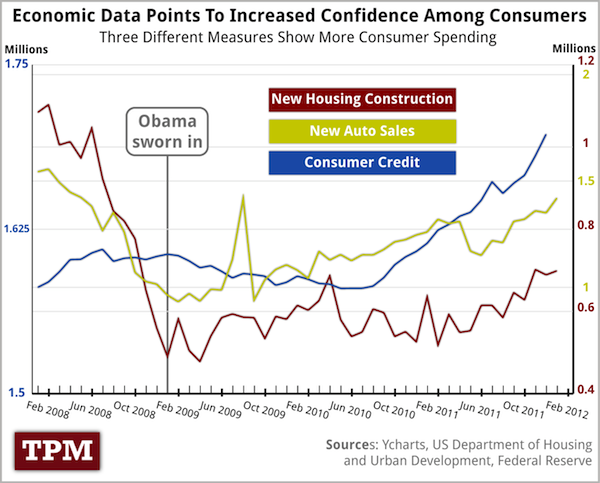 I think President Obama’s economic stimulus program kept things from being worse than they otherwise would have been. I don’t think Mitt Romney’s and Paul Ryan’s economic philosophy, which is essentially make rich people richer and poor people poorer, would help. But I do criticize Obama for giving free rein to the too-big-to-fail banks whose fraud and follies were the immediate cause of the crash, and thereby setting the stage for a new and bigger crash. Click on Economic Policy Institute for the EPI home page. Click on The State of Working America to read the digital edition of the EPI report. A print edition is scheduled for publication in November. Click on Did the stimulus work? 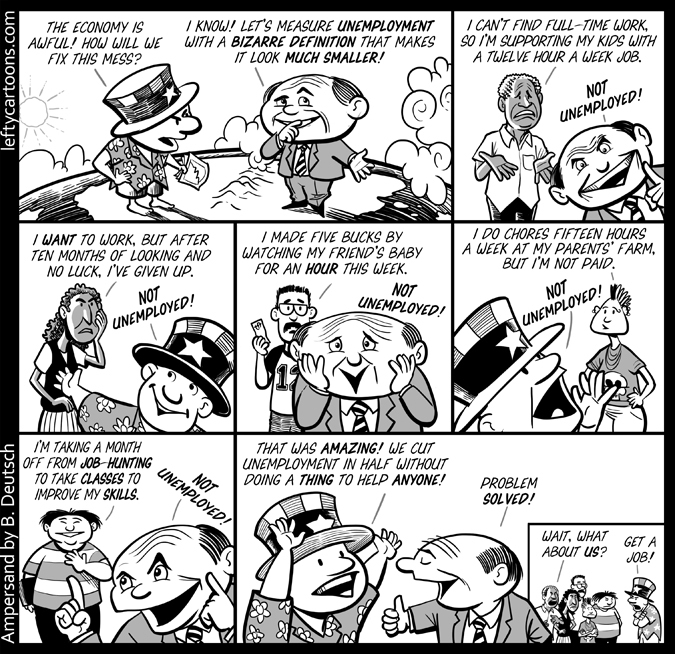 for summaries of 15 economic studies by Dylan Matthews of the Washington Post’s Wonkblog. Matthews’ scorecard is that 12 studies said the stimulus was beneficial, two said it was useless and one said the effect is uncertain. Click on Obama, Romney and the Low-Wage Future of America for an article by Dan Froomkin for Huffington Post Nieman Reports on the lack of a plan from either candidate for a full-employment, high-wage economy. 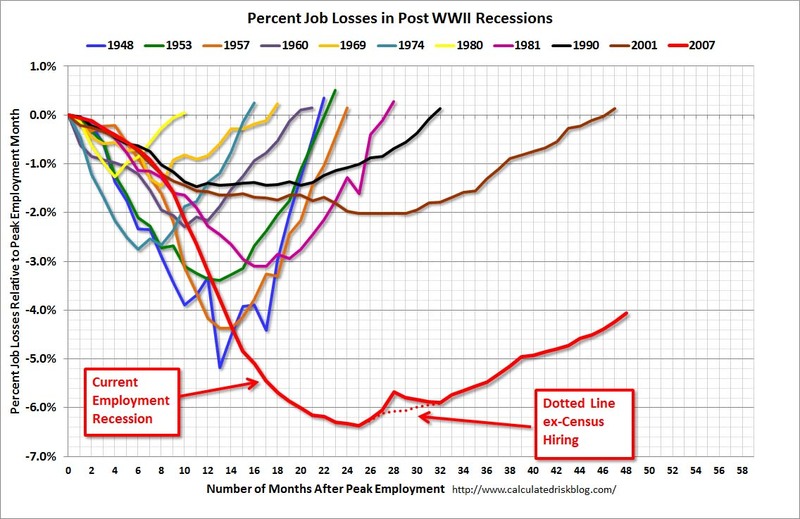 In other recessions since World War Two, government employment was stable, and helped stabilize the economy. Not this time. Mike Konczal said the cutbacks are mainly a result of conservative Republican ideology, which asserts that government services are unnecessary. Just one state, Texas, accounts for 31 percent of the loss in government jobs. The 11 states the Republicans won in the 2010 elections account for slightly over 40 percent. That’s a total of more than 70 percent. Now it’s true that this recession is the worst since the Great Depression of the 1930s, and it also is true that many state governments have constitutional requirements for balanced budgets. But fewer than a quarter of the states account for more than 70 percent of public sector job cuts. This indicates that the recession is being used as an excuse by right-wing Republicans who are hostile to public services on principle. Click on Public Sector Layoffs and the Battle Between Obama and Conservative States for Mike Konczal’s full analysis on the Next New Deal, the blog of the Roosevelt Institute. Click on America’s Hidden Austerity Program for more from Ben Polack and Peter K. Schott, two Yale University economists. Hat tip for the graphic to The Big Picture. 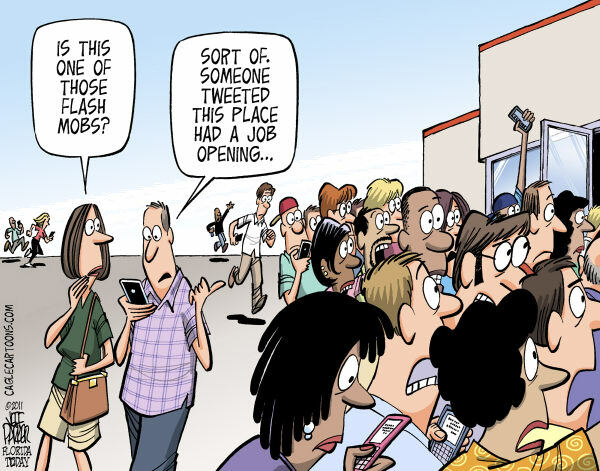 It’s no wonder so many young people today prefer to focus on the virtual world of Twitter, Facebook and the other social media. The real world is bleak. The unemployment rate for workers age 16 to 24 is higher than 16 percent. And many of those who are working take any job they can get, just to get by. 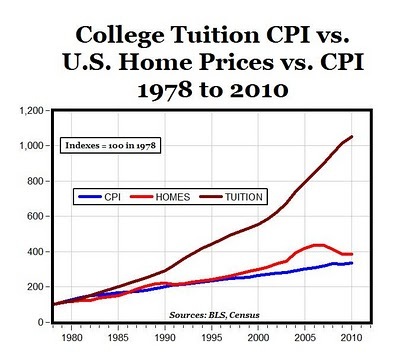 The cost of college tuition is going through the roof. But things are rough if you’re just a high school graduate. 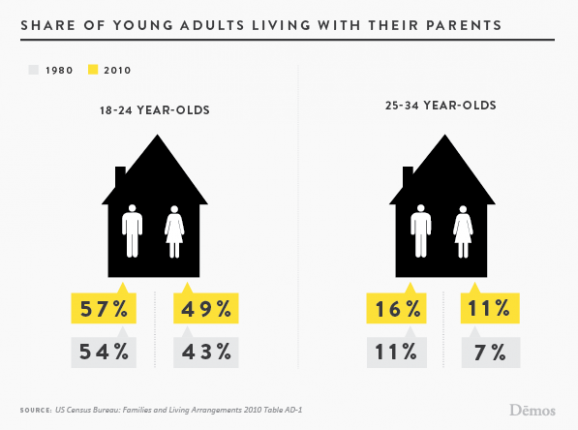 No wonder so many young people are still living with their parents. My parents gave me a better world than the one they grew up in. I am leaving those who come after me a world with less opportunity than I had. Click on These Charts Show How Desperate Young People Are For Jobs for more charts and background information. 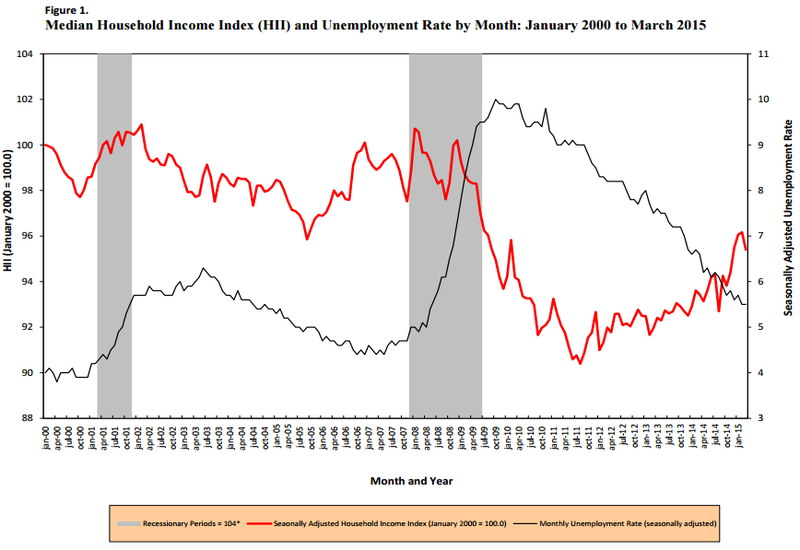 Click on The young and the jobless for more charts and background information. Click on Diminishing Returns for a report on the plight of college graduates by the Philadelphia Inquirer. President Obama said in a speech sometime back that everybody should get some education beyond high school. This might be a good thing, but, in itself, it does nothing to create jobs. 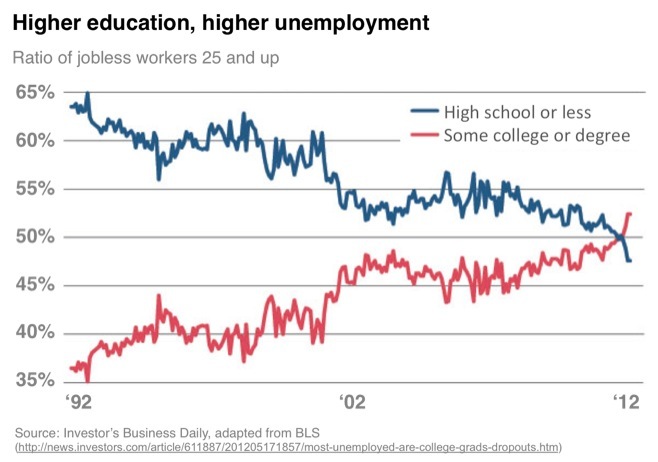 A majority of the unemployed now have some education beyond high school. Without an increase in available jobs, all that increased college enrollment will do is raise the bar for getting a job, and create a better-educated class of unemployed. Click on College Graduates, Dropouts Now Account for Majority of Jobless 25+, First Time Ever for background information and the source of the chart from Investors’ Daily. 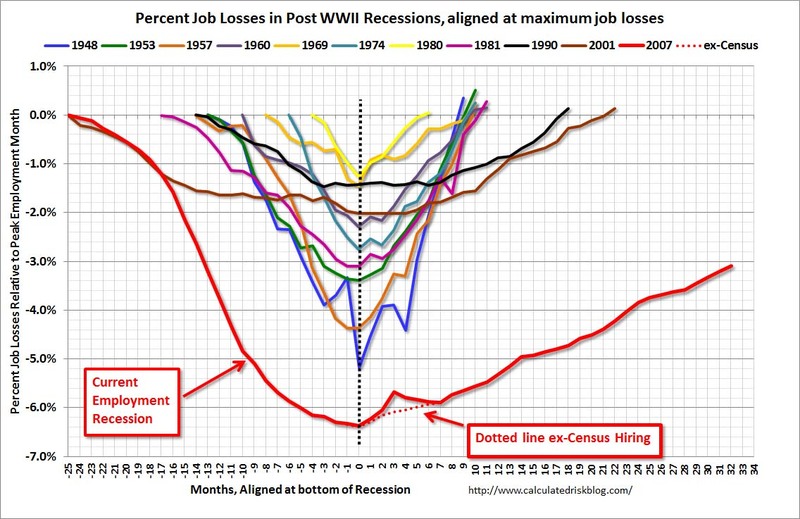 This chart shows how much worse job losses have been in this recession compared to other recessions since World War Two. 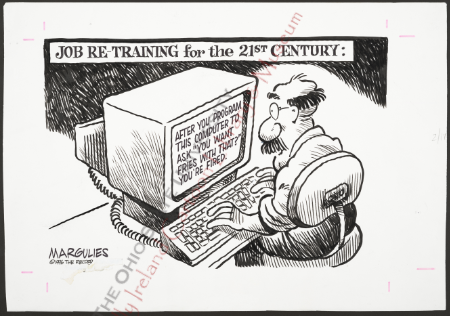 Mike Konczal, who posts on the Roosevelt Institute web site, pointed out that unemployed Americans are dropping out of the labor force at a faster rate than they are finding jobs. Click on Rortybomb for his post. Heidi Shierholz, of the Economic Policy Institute, said the outlook is probably better than the figures indicate, because of seasonal factors, but the outlook is still grim, including for new college graduates. Click on Economic Policy Institute for her analysis. Click on Calculated Risk for the source and explanation of the chart above, and more charts. The U.S. Bureau of Labor Statistics announced U.S. jobs figures as of January 2012. 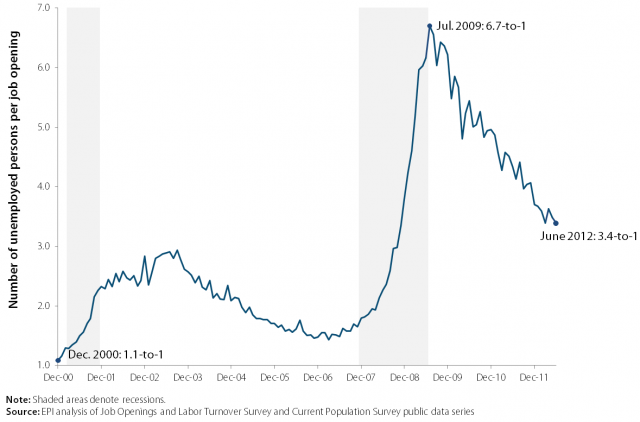 The good news is that employment in the United States is slowly recovering. 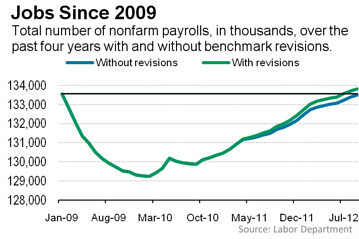 The bad news is that the economy has a long way to go before jobs get back to pre-recession levels. 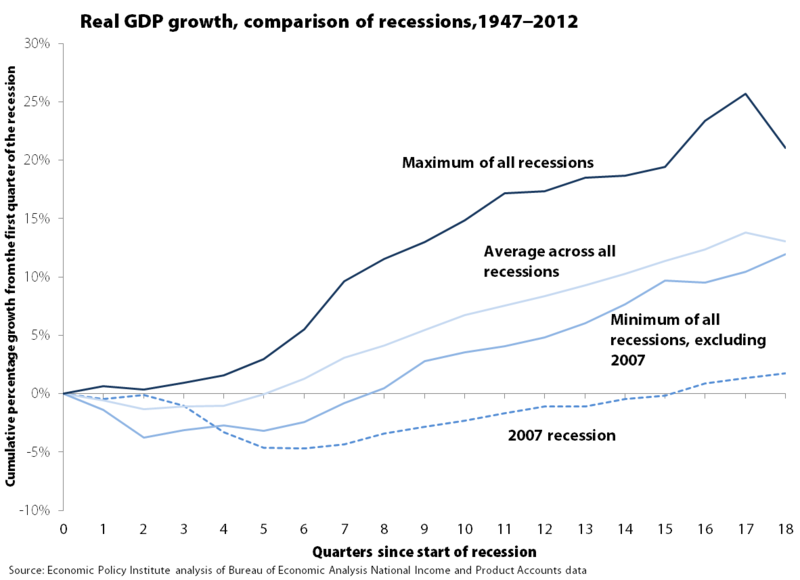 The chart above, which compares the current recession with previous recessions tells the story. 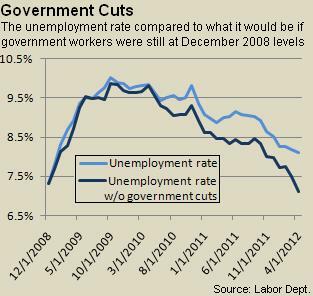 Note that the current recession started in December 2007, and President Obama was sworn in Jan. 20, 2009, about 14 months later. The unemployment rate for January was 8.3 percent, the lowest level since February 2009. The U.S. economy added 257,000 private sector jobs during the month, while an estimated 250,000 people entered the work force. Less than a third of the workers who lost their jobs in the Great Recession have made it back, or are climbing back, to where they were before, according to a Rutgers University study. 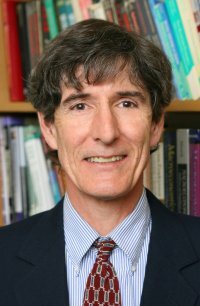 In August, 2009, researchers at Rutgers Center for Workforce Development interviewed about 1,200 workers, representing a cross-section of the population, who’d lost their jobs during the preceding year, and the researchers followed them for the next two years to see how they made out. The chart at right shows what they found out. The meaning of the five categories is as follows. Workers who have MADE IT BACK consider themselves in excellent, good, or fair financial shape and have experienced no change in their standard of living due to the recession. People ON THEIR WAY BACK have largely experienced a minor change to their standard of living, but say the change is temporary. They also consider themselves in excellent, good, or fair financial shape. 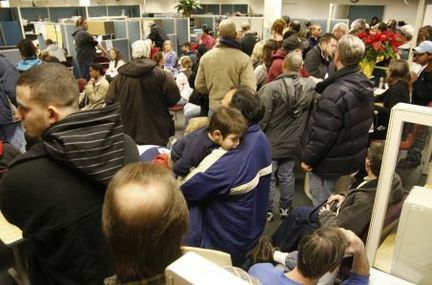 Workers who have been DOWNSIZED meet one of three conditions; they have experienced: a minor change that is permanent; a minor change that is temporary, but they are in poor financial shape; or a major change in their standard of living that is temporary and they are in at least fair financial shape. Workers classified as DEVASTATED have experienced a major change to their lifestyle due to the recession. They can be either in poor financial shape and think the change is temporary, or in fair financial shape but think this change is permanent. Workers that have been TOTALLY WRECKED by this recession have experienced a major change to their lifestyle that is permanent and are in poor financial shape. Of the 1,202 workers questioned, 47 percent rated their personal financial situation as “poor” and 36 percent “only fair.” The economic situation has had a “major impact” on 58 percent, and 41 percent expect the changes to be permanent. 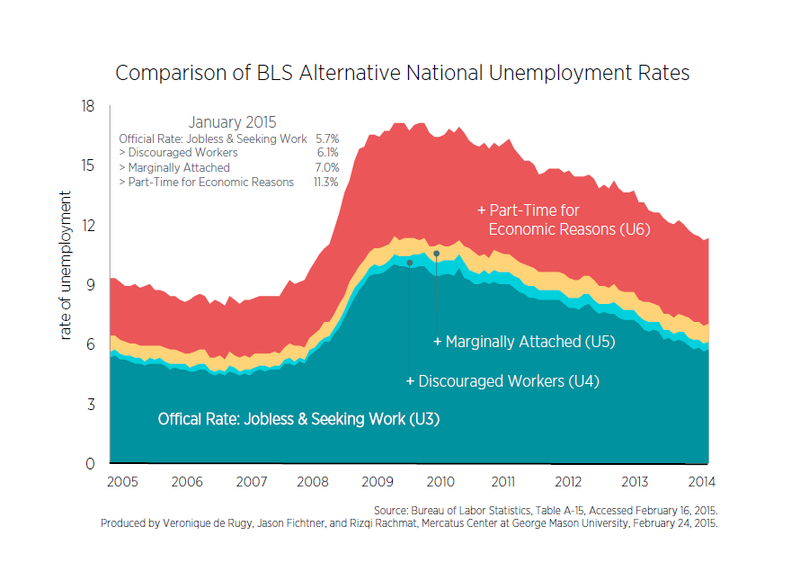 Click on Categorizing the Unemployed PDF for the full study. Hat tip to Digby at Hullabaloo.